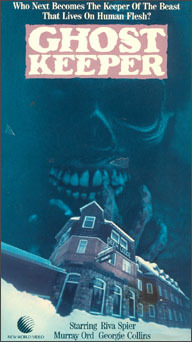 Enthusiasts of 1983's Curtains and other snowbound horror flicks might well be advised to take a look at 1981's Ghostkeeper, another Canadian low-key thriller...a creature slasher with a supernatural bent. Rarely seen or discussed, the story is based on an Indian legend and has shades of both The Sentinel by way of The Shining. In the Indian legends of North America, there exists a creature called Windigo...a ghost who lives on human flesh. Jenny (Riva Spier), her boyfriend Marty (Murray Ord) and Chrissy (Sheri McFadden) are part of a group that is on vacation and celebrating New Year's Eve. While checking out the snowy terrain on snowmobiles away from their lodge, they stop by a store and chat with the owner (played by Les Kimber). The storekeeper tells the three they should head back to the lodge because a storm is coming their way. Deciding to explore further, the group ignores his warning and they head up into the mountains. Near the top of a hill, they come across an inn called the Deer Lodge. Chrissy has an accident and although she's uninjured, her snowmobile doesn't start up again. The inn appears deserted and the guest book indicates that no one has stayed there in nearly five years. Marty says they should hang around until the storm that's blanketing the area dies down. The snowstorm grows and the group is forced to spend the night. Jenny enters one of the rooms and is unaware that someone is watching her from inside a closet. However, that evening, she becomes anxious...convinced that they are not alone. While looking for a wine cellar, Marty finds the innkeeper, an old disheveled woman (Georgie Collins) who says she lives there with her son. Although the hotel is closed for business, she allows the group to stay. In their room, Marty and Jenny get into an argument and the innkeeper overhears Marty accuse Jenny of fearing that she's going to "flip out" like her mother. Chrissy takes a bath and while in the tub, the innkeeper's son Danny (Billy Grove) sneaks in and shoves her head under the water. Danny drags her into a frozen lair in the basement where he slashes her throat and leaves her with a creature...the Windigo (played by John MacMillan). In a conversation with Jenny, the innkeeper remarks on Jenny's "toughness" - and says a person has to be tough to watch over the inn. She adds that she's "getting too old." In the middle of the night, Jenny gets out of bed and eavesdrops on the old woman speaking to her son. She tells him "you did fine..."
The next morning, Marty tries to start his snowmobile but it's been disabled. Jenny doesn't believe that the old woman even works there and tells her, "you've made it yours somehow." The innkeeper puts a drug in Jenny's coffee and she passes out. She wakes up in a room and finds a book called "Indian Legends of Canada" which mentions that the Windigo is a flesh-eating creature who can be "kept" by certain people, mostly females. Jenny discovers the lair and opens the door. Seeing the creature, she screams and Danny comes at her with a chainsaw. She manages to get away and from a ledge outside the attic, she pushes him off. Danny is impaled on an iron fence below. Jenny tells Marty about the creature and Marty soon starts to lose his mind, possessed by something. He wanders off, his face covered in grease from the snowmobile...and ends up frozen in the snow. The storeowner has made his way up to the inn to check on the group...and is promptly stabbed by the innkeeper. The old woman then makes a startling claim to Jenny. She says she is her mother. But as she attempts to plunge a knife into the girl, Jenny shoots her with a shotgun she has found. Jenny is overcome by the spirits of the inn and immediately takes her place as its new "ghostkeeper." A voice in her head says..."It's alright...Jenny will look after you now." Ghostkeeper was filmed in Lake Louise, Banff National Park in Alberta, Canada. The music by Paul Zaza is pretty and dramatic, reminiscent at times of Pino Donaggio's work. Not for all tastes, the methodically paced Ghostkeeper is an exercise in disciplined mood generation; its bare claustrophobia either works for the viewer or not. But for those who prefer their chills straightforward, pre-sneer and pre-sarcasm, Keeper can be a most rewarding snow trap.